The 5th child of 15 children born to the late Delbert and Alma Steffen, Msgr. Steffen is a native of Effingham, IL. He was ordained a priest on May 26, 1984 at the Cathedral of the Immaculate Conception. He received his associate’s degree from the Diocesan Seminary of the Immaculate Conception and Springfield College in Illinois. He holds his bachelor’s degree in philosophy from Cardinal Glennon College in St. Louis, both his Masters of divinity degree and theology degree from Kenrick Seminary in St. Louis, and holds a Doctorate of ministry in law from the Catholic University of America in Washington, D.C. 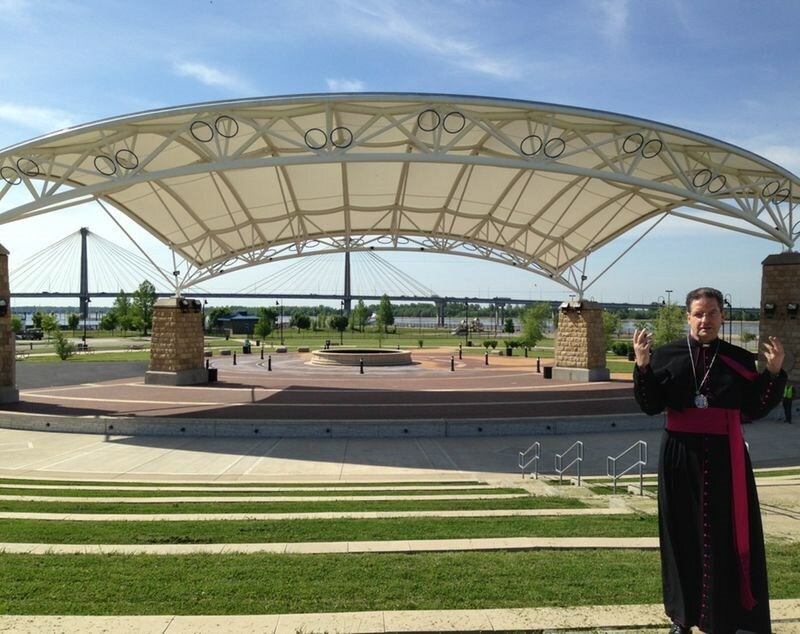 In August 2013, the Bishop was looking for an “ole” monsignor to fill in a vacancy at The Historical Saints Peter and Paul Proto-Cathedral, as the named priest was unable to fulfill his assignment. Monsignor Steffen accepted the Bishop’s request, while continuing to be the Chaplain for two hospitals, St. Anthony of Padua and St. Clare’s Hospitals in Alton, Illinois from 2011-2014, as well as the Chaplain and Spiritual Director for the Franciscan Sisters of the Martyr St. George Congregation located in Alton, Illinois. He serves as chaplain of the Filipino, Hispanic Communities and the 4th Degree of Knights of Columbus, and is the Pastoral Director for the Hospice Program of the above mentioned hospitals. In addition to the aforementioned duties, he also serves as an adjutant judicial vicar, judge, defender of the bond in the Matrimonial Tribunal of the Diocese of Springfield-in-Illinois since 1983, serves on various boards and committees of the two hospitals he serves. He is the Confessor and Spiritual Director for the Franciscan Sisters of the Martyr Saint George and Ursuline Sisters in Alton, Illinois. On May 26, 2009, he celebrated his Silver Anniversary of Holy Priesthood. Over the years of his priesthood, he has served as parochial vicar at Little Flower Parish in Springfield and St. Agnes Parish in Springfield, Sacramental priest to St. Joseph in Buffalo, Visitation in Illiopolis and St. Anne in Niantic parishes, pastor of St. Elizabeth of Hungary Church in Marine and St. James the Greater Parish in St. Jacob, co-pastor of St. James Parish in Riverton and St. Katharine Drexel Parish in Springfield, Visitation Parish and St. Anne Parish. He was also adjutant judicial vicar in the Office for the Tribunal, director of the Family Life Specialization and adjunct director of the Tribunal Advocacy Specialization in the Lay Ministry Formation Program for 23 years. He served as chaplain for the Springfield Catholic Medical Association, co-chaplain of the Riverton Knights of Columbus, episcopal vicar for matrimonial concerns, diocesan director of pilgrimages, and chaplain of St. Patrick Catholic School in Springfield, Illinois. During the Jubilee Year, he served as Director of Pilgrimages. He was procurator/advocate, defender of the Bond and diocesan judge for the Office for the Tribunal, served on the Priests’ Personnel Board, the Annual Catholic Services Appeal steering committee, the diocesan Hispanic Ministry Committee and the presbyteral council where he served two years as chairperson. He is a Knight of the Holy Sepulchre and is a member of the Canon Law Society of America.